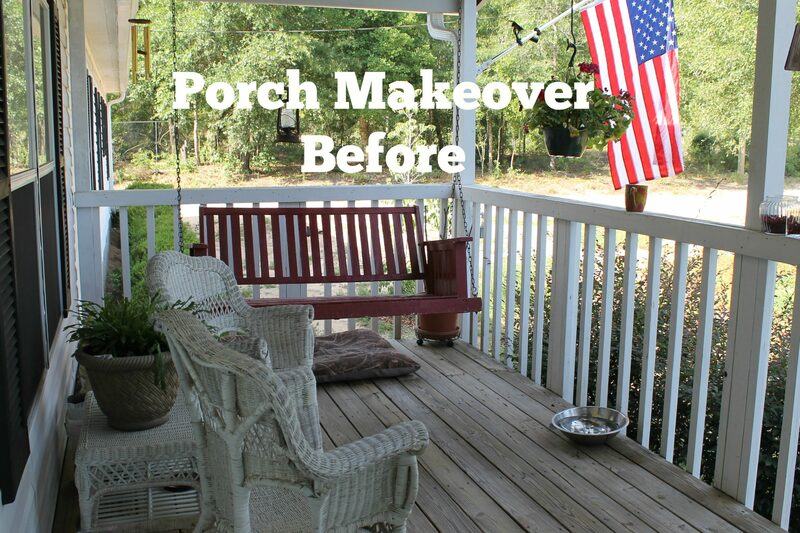 Our budget friendly porch makeover has been a lot of fun. While fun is a good thing, I’m happy to move on to the next project but not before I share the final results with you of the porch makeover. 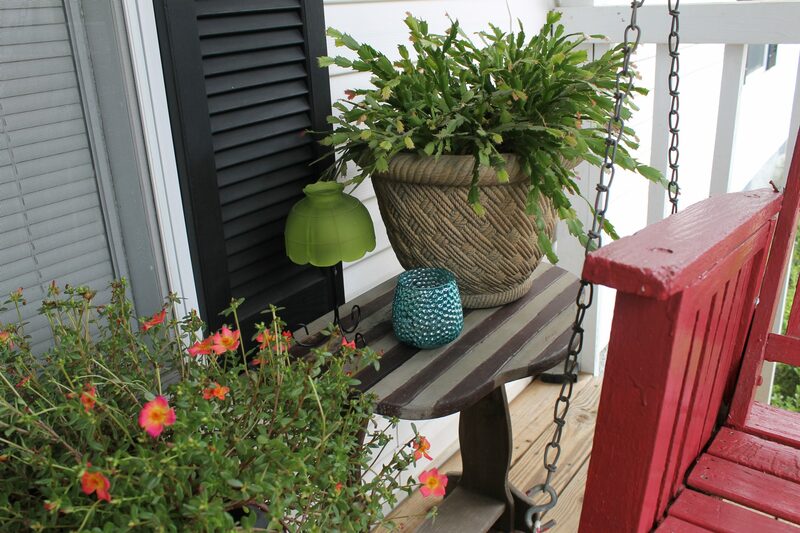 This is our front porch BEFORE we made any of the changes this Summer. The swing holds sentimental value to me because it was a gift from a former neighbor, an elderly Southern lady from whom I learned a lot. She taught me how to plant flower seeds properly, how to conserve water and some great cooking skills. Let me begin with some of the projects within the Porch Makeover Project. I picked up this old antique rusted out lantern from an estate sale. I knew it had potential and it did not disappoint. 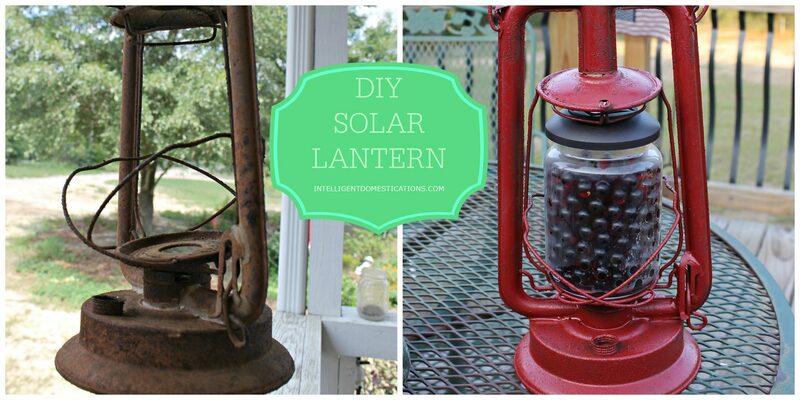 You can read about how I made this old lantern over into a solar lighting here. 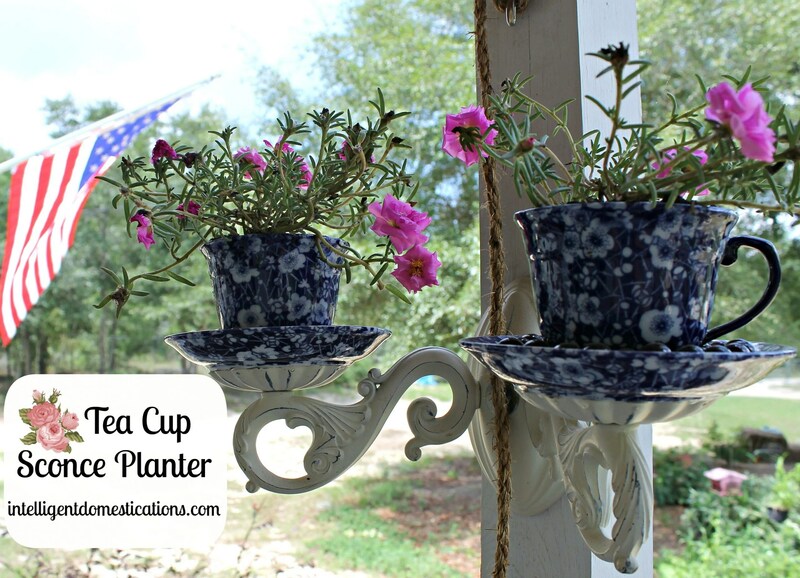 Our Tea Cup Sconce Planter was another fun project. While shopping for a chandelier to repurpose, we came across this beautiful sconce and simply had to find a way to use it. It turned out beautifully, don’t you think? You can read the step by step directions here on the blog or here on Hometalk. Our Solar Chandelier remains the favorite of both mine and my husbands. We enjoy sitting on the porch on a nice summer night and listening to the sounds of living in the country. Our Solar Chandelier provides subtle lighting which does not attract those awful flying bugs associated with southern nights. 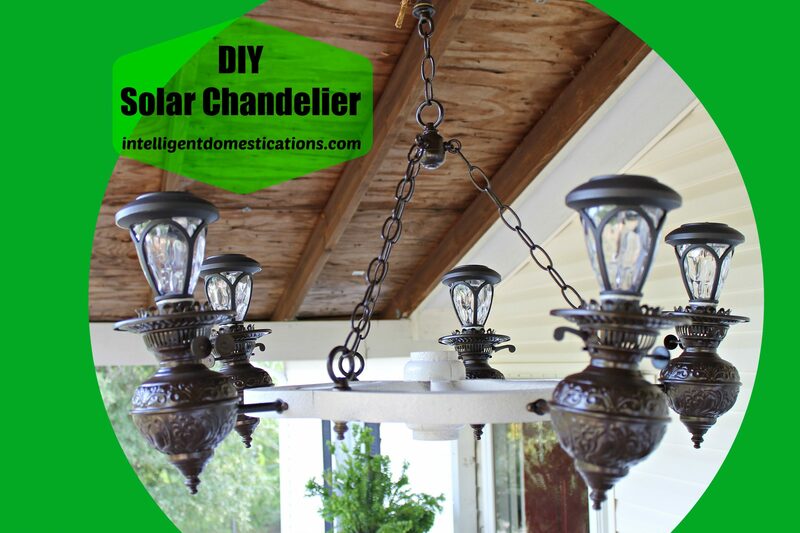 You can read how we made our Solar Chandelier here. There is one more project which I did not photograph the steps of along the way. 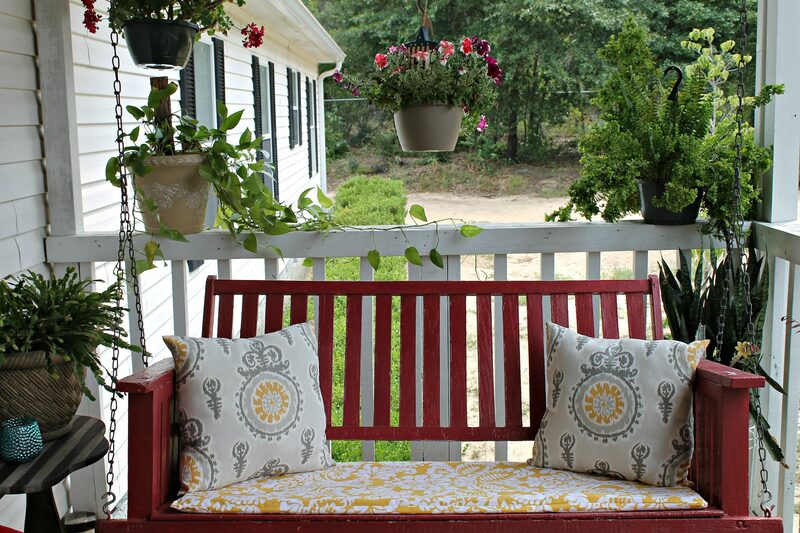 I am learning to sew, and I decided to make cushions and pillows to spruce up the porch! While making the pillows, I cut the fabric to be able to center the design in the middle of the pillow. There is some additional fabric waste to do it that way but the end result is totally worth it! Shopping in fabric stores to so much fun! 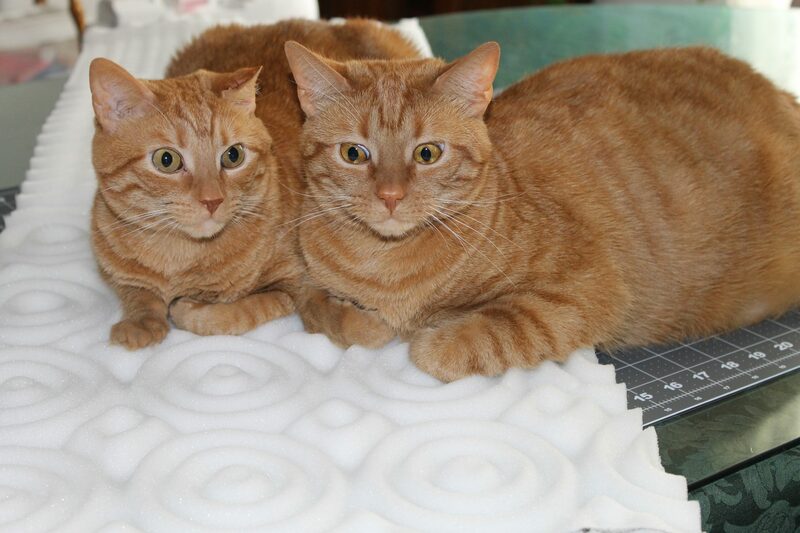 My tabby cats thought I needed them to hold down the cushion for the swing while I was ironing the fabric to cover it. I am very short, (4′ 11″ ) so I don’t like thick seat cushions at all because they prevent me from being able to place my feet on the floor. I wanted seat cushions but thin ones so I purchased a twin size mattress topper and cut the pieces to fit. It worked perfectly and was a lot less expensive than the foam inserts sold in craft and sewing stores. Then I just measured and cut the fabric to fit around the cushions, sewed and stuffed and there you have it. I will be sharing some more involved sewing projects in the future. 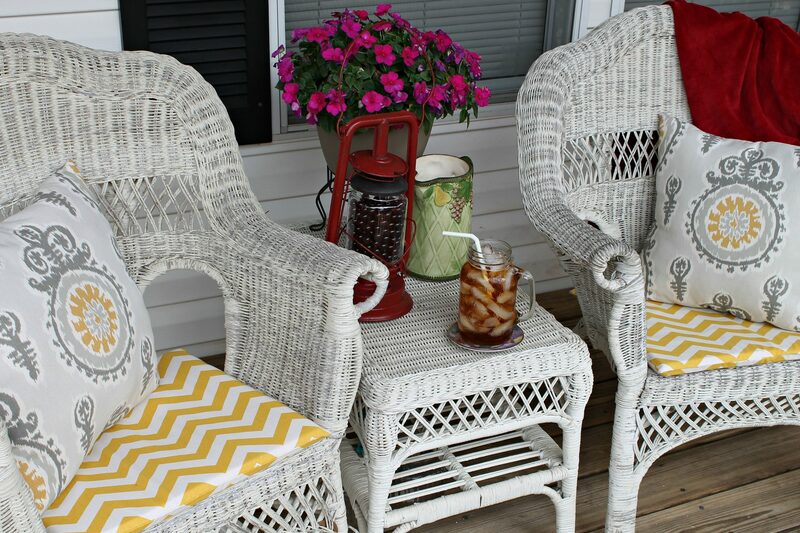 The white wicker furniture used to rest on my parents back porch where it has heard many conversations. We are emotionally attached to it but we know it has given it’s best years already. Although we did discuss new furniture, we decided to get one more summer from it. The red afghan was my mothers as well. Her best friend gave it to her as a gift knowing that red was Momma’s favorite color. I had to include some ‘Momma’ touches on the porch. The ‘coaster’ for tea is an Avon Mother’s Day collector plate. Momma collected those plates for many years. We purchased the Patriotic table a few years ago at a local arts and craft fair, hand made and solid wood with drop sides. It fits perfectly between the swing and the wall with one side down. The tea light candle holder was a thrift store find for only .50! That is a glass globe too! It’s just cute. We replaced our old wooden flag pole with a new metal pole and a new flag. 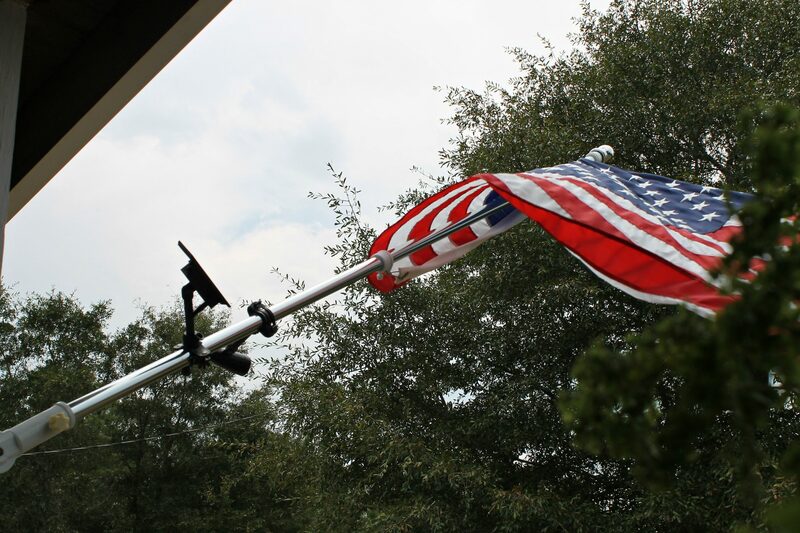 We also added a solar light made specifically for affixing to a flag pole. Go here to see the one we purchased. I know that is 3 different solar lights incorporated into our porch makeover project! It’s just beautiful at night! Bringing it all together. My sweet husband and I enjoy our morning coffee on the porch on the weekends. It cozy and comfortable now! This project really was budget friendly. Probably the most expensive purchase was the new flag pole and flag. Stacy has since completed his next project which was to build us a clothesline (we are trying to do a better job of living green) We are in the early stages of a new project which may take a while, painting the interior and replacing flooring! Pray for us! Thanks Kristy. We had fun working on this project. Thanks for stopping by! Wow! What a great “after”. I love all the personal touches you put into that. Thanks for sharing with the Merry Monday LInky Party! HI Nicole, thank you for stopping by and taking the time to comment. I will see you again at Merry Monday! I love beautiful front porches. They are the epitome of the south and delightful summers. Your porch is so inviting. I’d love to chat with you there over peach tea. I love the idea here. It looks so bright with colors! The new look is very nice and the pillows add a touch of class. No need for new chairs, right. Maybe you could come do my porch – or course I do not have one now. We are in-between moving and is camping out at a hotel. I love seeing all of the fun projects you’ve done! Great makeover! i love the before and the after. I love the small details such as the tea cups they are gorgeous! Love the porch! I always wanted a porch swing like yours. 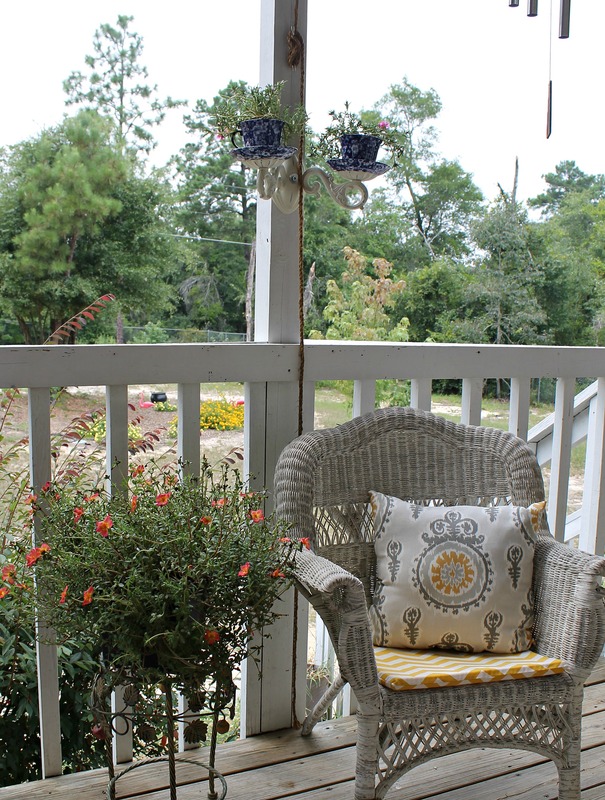 All the memories make the beautiful porch even more special. Blessings for your new project. I love it! I especially love the teacup planters. I love it when items are repurposed and given new life! Have a great week! I would have NEVER thought to make flower pots out of teacups AND hang them up in this way. Amazingly creative! Such great ideas! I love all the memories that go along with it! omg I love so much about your porch! My favorite would be the tea cups and the fabric! Such pretty choices! Thank you MJ. While my fabric was being cut a very nice customer asked me what my project was for it, she loved it too. That was nice. I’m not a chevron pattern kind of girl, generally, but I thought it went perfectly with the other 2 patterns. Fabric stores are dangerous $$ So much fun in there!! Really great changes that didn’t take a lot of cost! Thank you Tiffany. We didn’t track our spending but no, it wasn’t expensive at all. It was a lot of fun to work on together. We are happy with the results. Great makeover. It looks like a place that I would love to spend an afternoon with a good book. I really love the solar chandelier. Thank you Carmody. I’m usually distracted watching the squirrels and birds when I’m on the porch along with an occasional rabbit. We are out in the country so the sights and sounds of nature are wonderful. I do enjoy my coffee in the mornings on the front porch! 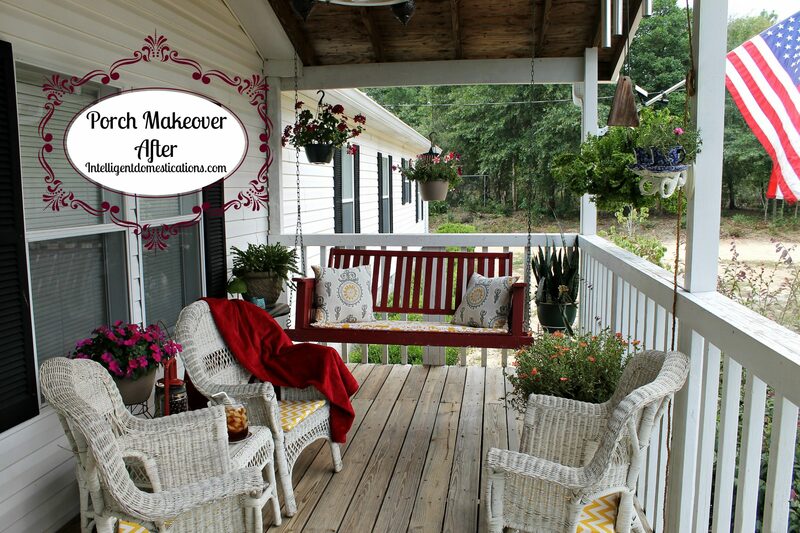 Oh, Shirley, I love your porch makeover! I especially like the pieces that belonged to your mom and all the memories attached. We also live in the country (after saying I would never live in the country again) and I love sitting on the porch having that first cup of coffee and watching nature wake up. Thank you Alli. We really enjoyed the process. Unfortunately I did not take pictures while making the pillows because as I am learning to sew, I concentrate so hard on what I am doing, I don’t even think of anything else. LoL! We are already on to the next project, new flooring and paint for the whole house!